Today is a special day in Scotland’s history and cultural identity. Every 25th of January since 1801 the birth of a Scottish icon has been recognised and celebrated. Robert Burns, often called Rabbie Burns by indigenous Scots, was born in Alloway, two miles from the coastal town of Ayr in the South-West of Scotland, on January 25th 1759. He was born into poverty and died in poverty living a relatively short life of only 37 years. He died on 21st July 1796. Yet from the age of 15 to his premature death Rabbie wrote over 600 poems, songs, letters and short stories which would make him famous across the world. In the field of literature, economics, politics and the arts generally we have also excelled as a relatively small nation. David Hume (1711-1776) and Adam Smith (1723-1790) are renowned philosophers and economists. Walter Scott (1771-1832), Robert Louis Stevenson (1850-1894) and Arthur Conan Doyle (1859-1930) are celebrated authors. James Keir Hardie (1856-1915) founded and led the Labour Party. Elsie Inglis (1864-1917) was a leading surgeon and active Suffragette. J.K. Rowling wrote the Harry Potter books which have become the best-selling book series of all time. Billy Connolly is one of the world's most famous comedians and Sean Connery is the best ever James Bond. The selections above are merely a toe in the water of a massive pool of Scottish born achievers, inventors and individuals of influence. Yet Rabbie Burns is the most famous of them all. 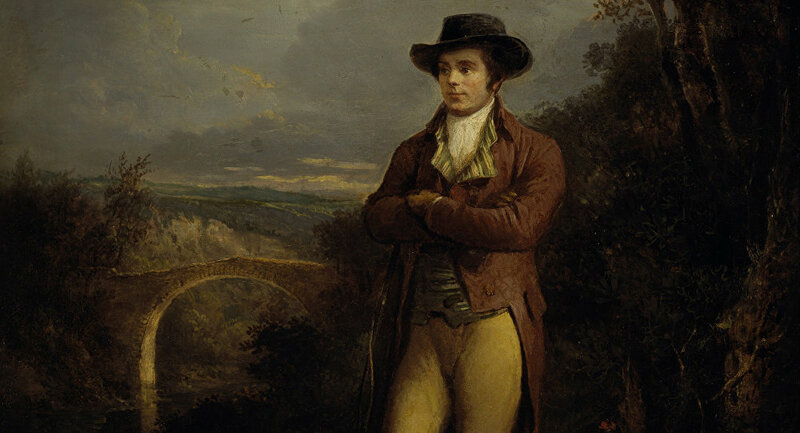 From Motherwell to Moscow, Beijing to Boston, Delhi to Dhaka celebratory events will take place in the form of Burns Suppers or Burns Evenings in honour of Scotland's National Bard. Only Christopher Columbus and Queen Victoria have more statues erected in their honour than Robert Burns across the world. There are seven statues of Rabbie in Canada and Australia, four statues in New Zealand and one in Paris. There are fourteen in America, including one in New York's Central Park. The former Soviet Union promoted Burns as the ‘people's poet' and he was taught in schools alongside their own national poets. In 1965 the Soviet Union became the first country in the world to honour Burns' memory with a postage stamp dedicated to him. Bob Dylan the legendary singer/songwriter cites Robert Burns as his greatest inspiration while academic research has recently revealed that he was also a major influence on the life and politics of Abraham Lincoln and his determination to abolish slavery in America stemmed from reading Burns poems and songs. Auld Lang Syne is a world recited song of Burns which is recognised in the Guinness Book of World Records as one of the three most popular songs in the English language alongside Happy Birthday and For He's A Jolly Good Fellow. Burns was the first person to appear on a commemorative bottle of coca cola in 2009 and his works have featured in several famous movies including It's A Wonderful Life and When Harry Met Sally. Yet for many years I effectively ignored and even shunned Robert Burns. Growing up in Scotland a Burns Supper was associated in my mind with the Tories and Freemasonry. The Masonic Lodge has become synonymous with anti-Catholicism and I was always taught that Burns was a Free Mason and therefore likely to be a Tory. Conservative Associations in and around Glasgow regularly hosted Burns Nights and they used to be men only affairs. I viewed them as right wing and reactionary. I was ignorant and naive. What I realise now is the well to do in society, the small c conservative academics and large C Conservatives, had sought to claim the memory of Burns and cleanse him of any radical, revolutionary or nationalistic identity. How dare they seek to sanitise the real Robert Burns? Books like ‘The Canongate Burns' taught me about Burns the radical, Burns the Scottish patriot, Burns the revolutionary. His support for and membership of the Friends of the People, a society committed to parliamentary reform which was considered revolutionary in its day. The Glasgow lawyer and Friends of the People organiser, Thomas Muir, was tried for sedition alongside four others and sentenced to 14 years exile on Sydney Cove in Australia in 1793. Burns wrote his famous ‘Scots Wha Hae' in tribute to Muir and the others but he had to write it anonymously for fear of persecution by the network of spies that had been established to detect and punish radicals. Burns was inspired by and supported the revolutions of 1776 in America and 1789 in France. These were interpreted as movements for liberty and freedom against the tyrannies of foreign rulers and malevolent monarchies. There is evidence that Burns helped to raise funds to buy weapons in support of the French revolution. He was an anti-royalist himself, a republican who raged against the privileges, pomp and power that the monarchy and their lackeys assumed. His seminal ‘Is There for Honest Poverty' (1795) was a searing condemnation of royalty and a statement of republicanism. He was also a proponent of Scotland's freedom from England with his ‘Parcel of Rogues in a Nation' (1791) standing the test of time as a complete and caustic condemnation of those politicians and landed gentry who conspired to sell out Scotland's independence in 1707 for personal gain and without a hint of popular support or consent. A MERE 26 SUPER RICH INDIVIDUALS NOW HAVE A COMBINED WEALTH IN EXCESS OF 3.8 BILLION PEOPLE, HALF THE WORLD'S POPULATION. THAT'S CERTAINLY WHAT WE DO TO SUSPECTED BENEFIT CHEATS. HE WASN'T HUNTED DOWN AND SHAMED AND SANCTIONED. NO. MILLIONAIRE TAX DODGER PHILLIP GREEN IN 2005 WAS KNIGHTED AND BECAME SIR PHILIP GREEN IN 2006. STEP FORWARD GARY ‘TAX DODGING' TORY BARLOW. "THAT MAN TO MAN, THE WORLD O'ER SHALL BROTHERS BE FOR A' THAT"